Shawnee’s Christian Ford is coming off a strong indoor season that has him aiming for a return to state. 60 Meter Dash: 5. Christian Ford (Shawnee), 6.97 seconds. 200: 3. Christian Ford (Shawnee), 21.66. Triple jump: 22. Isaac Connelly (Celina), 10.7 meters. 60 Meter Dash: 2. Josh Verhoff (Kalida), 7.02 seconds; 3. Robby LeFevre (Fort Recovery), 7.04. 200: 1. Josh Verhoff (Kalida), 21.68 (state record); 3. Robby LeFevre (FR), 22.31. 400: 4. Drew Muhlenkamp (FR), 50.48. 800: 16. Matt Gaerke (Parkway), 2:06.26. 1,600: 13. Karter Tow (Lincolnview), 4:44.26. 3,200: 17. Karter Tow (Lincolnview), 10:12.13. 60 Hurdles: 1. KeShawn Spivey (Elida), 8.35. 800 Relay: 1. Fort Recovery (Robby LeFevre, Jacob Acheson, Riley Pearson, Owen Moorman), 1:31.33. Shot Put: 3. Austin Clay (Van Wert), 16.86 meters, 23. Hunter Roethlisberger (Columbus Grove), 12.78. High Jump: 12. Dan Selby (CG), 1.72 meters. Pole Vault: 14. Jacob Michael (Elida), 4.11 meters. Triple Jump: 17. Quinn Humes (Waynesfield-Goshen), 11.03 meters; 22. Grady Spencer (W-G), 10.32. Weight Throw: 3. Austin Clay (VW), 17.33 meters; 20. Austin Birt (W-G), 13.04. 200: Hannah Berheide (Kalida), 27.87; 19. Rachel Barrett (Parkway), 27.05. 1,600: 16. Emma Koenig (Botkins), 5:32.98. 3,200: 3. Alyssa Ellerbrock (CG), 11:24.98. Shot Put: 3. Jill Gemmer (VW), 11.47 meters; 4. Kirsten Clay (VW), 11:46; 9. Grace Hoffman (Ottawa-Glandorf), 11.16; 14. Ella Rigel (Leipsic), 10.69. Pole Vault: 12. Jessica Break (Coldwater), 3.35 meters; 19. Megan Abels (FR), 3.04. Long Jump: 1. Carlee Siefker (Leipsic), 5.35 meters; 21. Peyton Heitmeyer (Leipsic), 4.41. Triple Jump: 1. Carlee Siefker (Leipsic), 10.55 meters; 12. Reilly Cox (Celina), 9.43 meters; 21. Rylie Barrington (Waynesfield-Goshen), 8.57. Weight Throw: 2. Jill Gemmer (Van Wert), 13.41 meters; 3. Ella Rigel (Leipsic), 13.05; 6. Kirsten Clay (VW), 12.69; 7. Kennedy Flores (Columbus Grove), 12.65; 15. Faith Anderson (CG), 11.16. 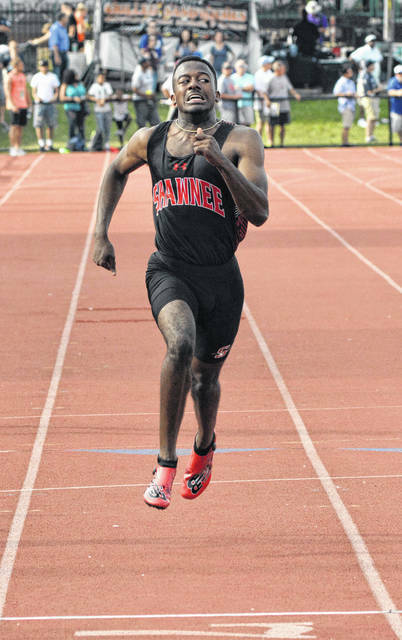 SHAWNEE TOWNSHIP — Christian Ford finished fifth in last spring’s Division I State Track and Field Championships in the 200-meter dash. The Shawnee High School senior has made no bones about his goal this time around — to finish the job this spring as he and his teammates prepare for the 2019 track and field campaign. When the Indians open the season against St. John’s and Waynesfield-Goshen on March 26, that will begin his quest in earnest. Everything he does will be to present himself with the best possible chance to be atop the podium at Jesse Owens Memorial Stadium at The Ohio State University in Columbus on June 1. “I was fifth last year in the 200-meter dash. I also made it to state in the 100-meter dash but didn’t place. That is my goal, win state in the 200 meters,” Ford said. Ford has been preparing to do just that ever since his senior year began and began the process to get there. “I played football in the fall and when that was over, I ran indoor track during the winter. I participated in the New Balance Invitational, I went to an invitational in Kentucky as well,” Ford said. “I have a great idea who some of the guys I will have to beat this spring. Based on what I have seen and competed against, I will have to run well. We have a fast state, especially when you get down there. Ford has already announced he will be attending Youngstown State in the fall but that did not take away his thirst for the title in the least. “Running the 100 helps me stay loose and warmed up, as does running the relays. Even running the 400-meter dash is a help, which I’ve run in the past. Whatever I can do to help and it helps me,” Ford said. “When you run other events, especially when it starts getting hotter, you have to be smart: drink your water and Gatorade, keep yourself hydrated. You don’t want to start cramping. That is true even when it’s not so hot out. You need to get into the right frame of mind about caring for your body, no matter the weather. His coach at Shawnee, Mike Lewis, is in the same mindset as his senior charge. Lewis broke down what the sprinters go through during preparations. Lewis said Ford’s best event is the 200 but running in the 100 and 400 races, as well as relays, aid his preparation. https://www.limaohio.com/wp-content/uploads/sites/54/2019/03/web1_div1-2024-2.jpgShawnee’s Christian Ford is coming off a strong indoor season that has him aiming for a return to state. Reach The Lima News sports department at 567-242-0414.